Finland: Group of gullible people rally in Helsinki, insist next government take draconian measures to combat “Global Warming”……. – The Tundra Tabloids……. When the truth about what really drives the earth’s climate is there for all to see. 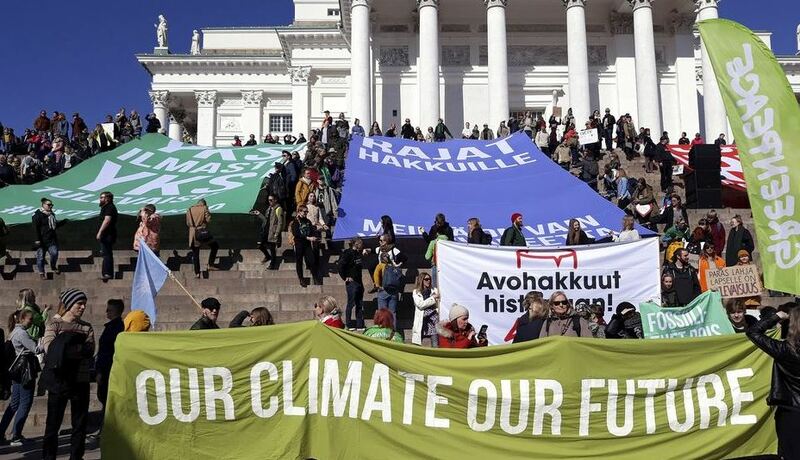 Police estimated that around 10,000 protesters descended on downtown Helsinki on Saturday to protest the government’s inaction over combatting climate change. Protesters carried placards and chanted as they made their way through the centre of Helsinki from the Senate Square over to the steps of the Parliament House, starting at 2.00pm. Demonstrators called for drastic political measures and structural reforms to ensure that the global mean temperature does not rise by more than 1.5 degrees Celsius and that consumers do not end up bearing the brunt of the burden for effecting change. Previous Post Previous Post Daniel Greenfield: What’s behind Omar’s Hijab (video)……. Next Post Next Post Adrew Bostom: Removing Jew-Hatred From the Mosque; A Vatican II Paradigm For Islam……?